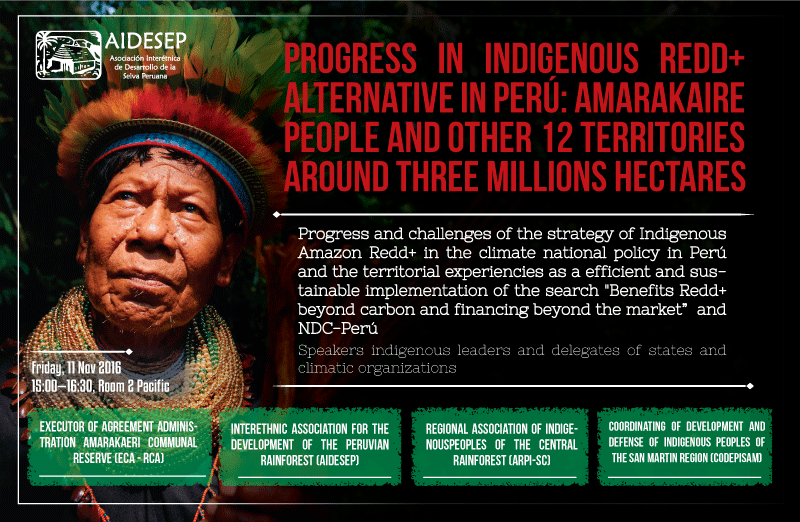 This event, held at the 22nd Conference of the Parties in Marrakech, Morocco, will focus on the progress and challenges of REDD+ in Amazon indigenous communities in Peru, as well as the efficiency and sustainable implementation of the government of Peru’s national climate policy. Speakers for this event will include indigenous leaders, delegates from state governments, and representatives from climate organizations. This event is organized by the Executor of Agreement Administration Amarakaeri Communal Reserve (ECA-RCA), Interethnic Association for the Development of the Peruvian Rainforest (AIDESEP), the Regional Association of Indigenous Peoples of the Central Rainforest (ARPI-SCI), Coordinating of Development and Defense of Indigenous Peoples of the San Martin Region (CODEPISAM).